When I first got married and started decorating our home, I would search the clearance aisles at home stores and craft stores and buy little trinkets to fill up spaces in my home. After the holidays, I would search the clearance racks for deals. I loved finding pumpkins or Christmas figurines for 50-80% off! But those little purchases kept adding up and were creating clutter and costing me money. Then we started living on one income shortly after we moved into our new-to-us home. At first I wanted to buy new things to decorate, but the penny-pincher in me knew that I could create a home that I loved by using items we already had. As I move to a more simplified life, I am realizing that I want my home to be filled with less stuff. Instead of going out and buying MORE, I am using what we already have to create a home that we love. 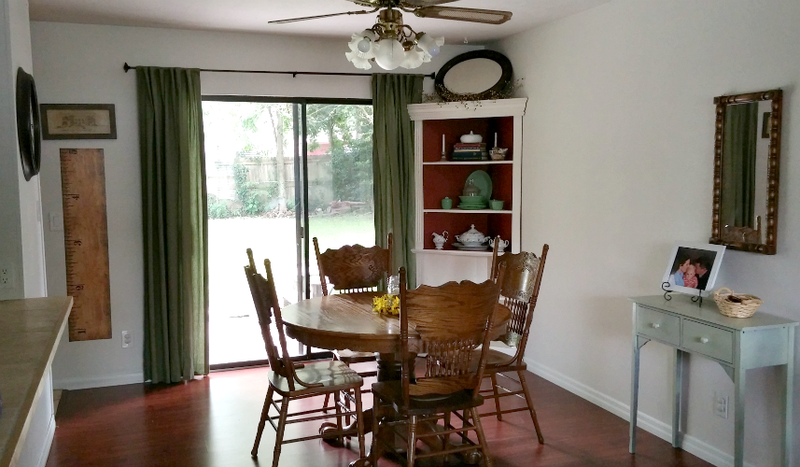 Below is a picture of our dining room. I shopped the house for everything in this room! The only thing that I bought in this room is the curtain rod. 1. Decide on functional pieces first. Many times your decorative items can be functional as well. Before you start decorating a room, figure out how you want to use that space. Our dining room has sliding glass windows and we needed to cover them up somehow. Instead of buying expensive blinds that I really didn’t want anyway, I used some curtains that I already had. They are functional and decorative. It is hard to fill up a space quickly. When you take your time, you will find items in your home that will work in the new space. The more time you spend living in your home, the better you will be able to decide if something feels right or if it needs to be changed. The corner cabinet in our dining room was left by the previous homeowners. They had it in the living room. We moved it to three different corners of the house before deciding that it worked best in the dining room. It took time to realize this is where we wanted it. One of my favorite decorating books is The Nesting Place* by Myquillyn Smith. She loves shopping her house, and rearranging furniture is something she suggests all the time for redecorating. 3. Don’t be afraid of blank spaces. Not every square inch needs to be filled in. Let your spaces have breathing room. Sometimes we think we have to fill up all of the blank spaces, but that just means you need more stuff! I have kept my dining room wall blank on purpose. I think if I were to put more up, it would make the space look cluttered. 4. Look for items with the same color or feel, but don’t be too specific. Not everything in your home has to match perfectly. In fact, when you mix and match patterns, textures, and old and new items, it creates a cozy feeling. However, you do want to make sure that your items don’t clash. I have several shades of green and wood tones in this room. They don’t match perfectly, but I think they go together nicely. The small green table was red before I painted it. While several items in the room are green, I have purposefully stayed away from a theme, so that I can include different pieces in this room. 5. Try different items in different ways. 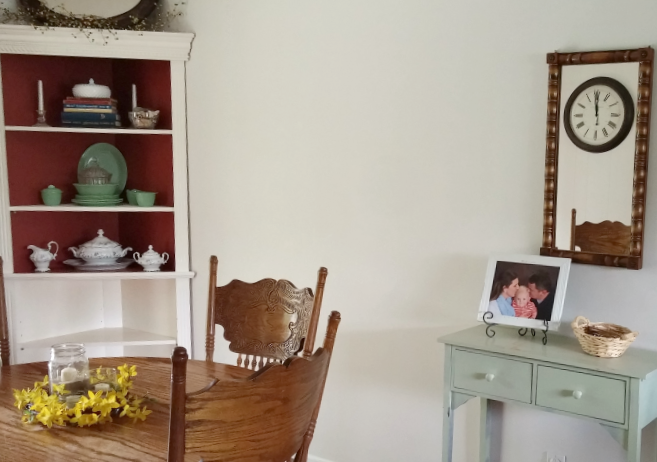 When the corner cabinet was in the living room, it held books and baskets filled with games. Now it holds my China and Fire King glassware. Well, mostly. I have a one year old so the bottom 2 shelves are empty! 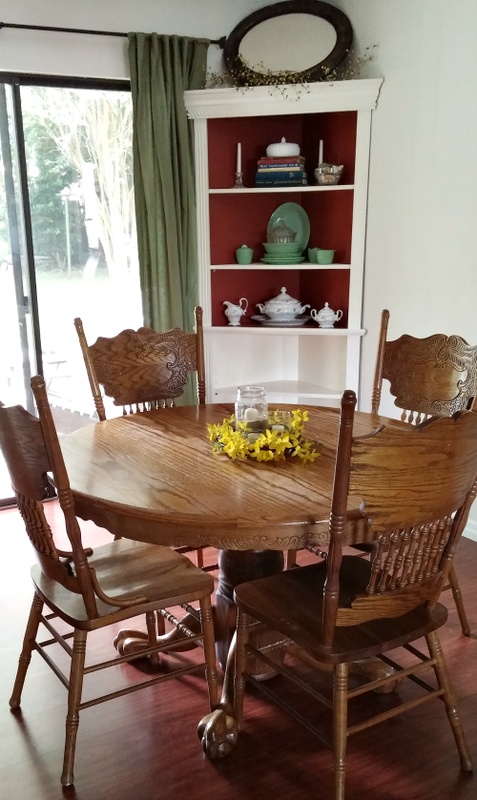 The dining room table in our dining room was given to us by my husband’s aunt. 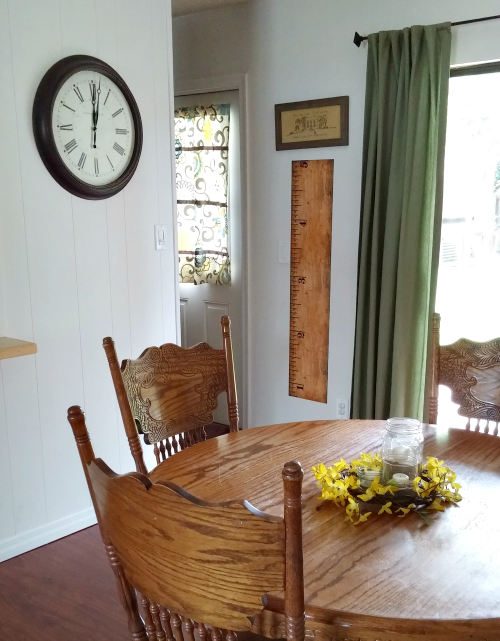 The mirror on the wall was my husband’s grandparents, and the corner cabinet was left by the previous homeowners. All of those items were free to us. I accepted them because I knew we could use them. There have been times I have not taken free items because I couldn’t use them, and they would have just added clutter to our home. Buying all new items for your home can be fun, but it can become expensive and create more clutter. The next time you want to decorate a place in your home, try shopping your house first. Often you already have something that can be reused. Looking for more decorating ideas? Check out my Homemaking Resources. It sounds like you have reused lots of items! I love seeing old windows used in different ways. Thank you for sharing on Pinterest! I always enjoy linking up! These are great tips! I've definitely gotten more minimal in my decorating because it's just too expensive to try to fill everything. Thanks, Tif! It does get expensive filling up every space, not to mention it is more stuff to have to dust and keep clean! Ha! Right now we're actually looking to downsize, remove items to make our house look larger, but these are such great tips for house decorating. We're probably going to re-do some of the wooden furniture we have to make it look better and new. Thanks, Liz! I think it is great when you are able to reuse furniture you already have. It not only looks better, but you are able to put your own spin on it. We just rearranged some rooms in our home and got rid of extra stuff. It was amazing how much more livable space we have! Thank you for invitation, Mimi! I love finding frugal bloggers! Love your style. I think it is prettier this way. You end up with such a better look than if you buy everything to match. So true. I love a room that has been decorated by collecting items over time that have meaning behind them! What a sweet home! Thank you for sharing your ideas. Aww, thank you, Ann! I appreciate you stopping by and hope these ideas were helpful.